Talent City Hall is located at 110 East Main Street, Talent, OR 97540; phone: 541-535-7423. Photo: Beeson-Foss Ranch (The Nut Ranch), ca. 1863, 6371 Wagner Creek Road, Talent, OR. 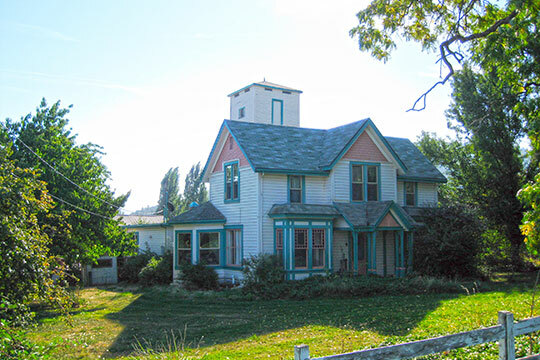 Listed on the National Register of Historic Places in 1999. Photographed by User:Ben.waterhouse (own work), 2012, [cc-by-3.0 (creativecommons.org/licenses/by/3.0)], via Wikimedia Commons, accessed June, 2015. Before European-American settlement of the Rogue Valley, the fertile alluvial plain provided sustenance for the Shasta people and various tribes of the Takelma people. The area provided acorns in abundance, camas bulbs, seeds and berries as well as deer, salmon and other fish. Field burning was practiced to allow harvest of tarweed seeds and also served to enhance understory conditions for berries. Abundant materials were available for the creation of twined baskets and dwellings. Winter homes were rectangular wood structures, built with tamped earth floors two feet or more subgrade. A low inner wall further insulated occupants from winter's cold, and provided room for storage between the two walls. It is not clear how far north the Shasta tribes' territory extended when fur traders and later settlers entered the area. But it is known that a Shasta seasonal encampment was located along Wagner Creek near Bear Creek. Some historians believe the Shasta were the dominant tribe in this area before the Takelma took control. The Latcava, a subgroup of the Takelma, lived in the immediate area of what is now Talent. One distinction between these two Takelma groups is that the Latcava used rafts for water travel, while others of the Takelma had canoes, a significant technological advantage. The Takelma were a strongly territorial group of tribes with a communication system that allowed them to relay messages from the California border to the Willamette Valley. In spite of their sophisticated communications, it does not appear that the Takelma had a formal political structure beyond the tribal level. The different groups of Takelma and other area tribes were referred to collectively as the Rogue Indians. It was only five years from the first successful settlement of the Wagner Creek area to the last battle of the "Rogue River War." That last battle started in October 1855. Gold miners were particularly aggressive in the elimination of the native population, both by acts of aggression and by the destruction of fish habitat caused by typical mining practices. Local treaty attempts that included retention of hunting and fishing rights were never ratified. Treaty negotiations were primarily conducted in Chinook, a pidgin language that fur traders had developed in the process of trading in the region. This practice further undermined the possibility of fair or otherwise successful treaty negotiations. After the war ended in June of 1856, the remaining native people were moved to a reservation at Table Rock. When local hostilities did not end, the Table Rock Reservation was dissolved and the local people were removed to the Grande Ronde Reservation on the Oregon coast. The Grande Ronde Reservation was closed in 1956, but the Confederated Tribes of the Grande Ronde were restored to tribal status in 1983, an action which restores the group's treaty rights. City of Talent, Oregon, Comprehensive Plan, 2014, www.cityoftalent.org, accessed June, 2015.